Flossing between teeth and below the gum line provides a deeper clean than can be achieved by brushing alone. The American Dental Hygienists Association published a paper a few years ago saying that interdental cleansing is vital to oral health. Your dentist likely recommended flossing to improve your oral cleanliness. It can be tough to make a choice between two great flossing devices. We have broken down the features, benefits, and differences to help you make the best choice. The Aquarius provides a large reservoir for holding water. Most reservoirs are gauged based on the length of time that you can use the flosser. Whether it’s 30, 60, or 90 seconds will influence the depth of the clean it provides. The Aquarius provides 90 seconds of capacity and flossing. Water flossing requires a certain amount of time spent on the task. It’s important that the cleansing is deep and prolonged to remove plaque. It only takes one minute per day to have a cleaner mouth. The Aquarius helps with that prolonged flossing by providing a one-minute timer. The Aquarius also gives the user a 30-second pacer. That will alert you when it’s time to move from the top of the mouth to the bottom or vice versa. You’ll always time the amount of your flossing perfectly. An on/off slider on the handle will easily switch the water flosser to the on position. It’s easy to control the flow of water when the switch is a slider on the handle. You’ll place the 360-degree swivel tip into your mouth and use the slider. It’ll instantly direct water exactly where you want. As soon as you’re done flossing, you can slide the switch into the off position without having to wait for the water to stop flowing. A great feature of the Aquarius is the fact that there are two flossing modes. There is a pulse-modulation technology that will remove plenty of plaque. That’s the traditional floss mode. This model also has a massage mode that improves circulation to the gums. Stimulation provides better blood flow to the gums and gives you a healthier mouth. This water flosser comes with plenty of tips for the entire family, too. 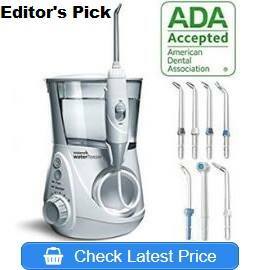 It has 3 classic jet tips, 1 pik pocket, 1 orthodontic, 1 toothbrush, and 1 plaque seeker tip. All those tips provide everyone in the family with a tip they need for a clean mouth. There is an LED mode on the Aquarius that will alert you to what mode the flosser is in at a glance. That can be very convenient for people who are unsure about the flossing capabilities of the device. Beginners will appreciate it. 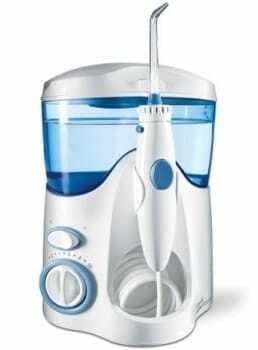 The Ultra has a reservoir that will hold 650 ml of water or any combination of mouthwash and water. This amount of liquid equals 90 seconds of water flossing. That’s more than enough for a healthier and cleaner mouth. There are not many flossers that have more than 90 seconds of water. On the handle of the flosser, there’s an on/off button. This button has to be held to start the water flowing and to turn off the water. The handle also includes a pause button if you need to stop the water flow. The handle also features a swivel tip. The swivel tip will move 360 degrees to get to various parts of your mouth. For example, the back molars are incredibly hard to reach. The swivel tip reaches that space easily. Included with the device, you get 6 color-coded tips. Those with a plaque problem will get a dedicated tip for that focus. Teenagers can use the orthodontic tip on their braces. Others can use the classic jet tip. There are 2 classic jet tips, 1 pik pocket, 1 orthodontic, 1 toothbrush, and 1 plaque seeker tip. The varied tips will give you personalization with this flosser. There are also 10 pressure settings to ensure that you’re getting the right amount. For beginners or those with sensitive teeth, they can start with the lowest setting. Advanced users can ramp up the power to satisfy their need for clean, too. Ultra protects the water in the tank with a lid. Like most other water flossers, you can add water at any time and allow it to get to room temperature. Conveniently, the lid also holds the extra tips when they’re not in use. The Ultra is available in 4 colors. There’s a sleek black that fits in with many modern bathrooms. There’s blue or orchid for those who like some color in their lives. There’s the traditional white, too. With both flossers being made by the same company, it’s no wonder that they have some similar features. They are features that the company is well-known for, too. The models are both part of the countertop design that will sit in the bathroom waiting for use. Instead of having to wash and put the device away after every use, you can leave it for the next member of the family. It sits beautifully on any counter or shelf in your bathroom. The 650 ml reservoir is the first similarity to be covered. The reservoir capacity is what will give you the amount of time for flossing. The water flows out of the reservoir and through the wand. In both units, it provides 90 seconds of flossing. Over the reservoir, you’ll find a cover on each model. The Ultra and the Aquarius both have covers over the water to ensure no debris or dust settles in there. Leave the water or mouthwash ready for your next flossing session. Each wand features a rotating tip. It will rotate 360 degrees for reaching back areas of your mouth. The Aquarius and the Ultra both have this great feature for removing more plaque and food from between teeth. It’ll blast the back molars then swivel to get behind the rest of your teeth, too. The two devices have various pressure settings. They both have 10 pressure settings that range in power from 10 to 100 PSI. It’s a measurement of the amount of power that’s delivered by the wand. PSI is pounds per square inch. The Ultra and the Aquarius provide 140 pulses per minute to remove plaque from between teeth. It also gets below the gum line to remove food and bacteria that can hide from normal brushing and flossing. Both devices come standard with a 36 month warranty, which is a feature from the Waterpik company. They are 120VAC/60Hz, too. The Aquarius and Ultra have tips included when the device is delivered to your home. There are classic jet tips, a toothbrush, a plaque seeker, orthodontic, and pik pocket tip. The Aquarius comes with one additional classic tip, but otherwise, they both come with all the tips you’ll need. There are many similarities between these two devices. It’s because Waterpik is a company that puts some of its best features into each and every water flosser. The Aquarius has a slider on the handle that allows the water to flow through the wand. You’ll turn on both units by using the button on the base. The water will flow through the handle to the wand on both devices. With the Aquarius, you’ll need to slide the button into the on position to get water flowing into your mouth. With the Ultra, you’ll have to hold the button to stop the water from shooting out of the wand immediately. This difference makes pausing the water flow a bit easier on the Aquarius. You’ll slide the button to the off position. That acts as a pause. On the Ultra, you’ll have to press and hold the button. While it’s not a huge stumbling block, it’s easier to control the flow of water through the Aquarius. Each device has a floss mode, but the Aquarius has a massage mode, too. This mode is meant to stimulate the gums. Those who suffer from bleeding or sensitive gums can increase the blood flow and healing to the area with the massage mode. The Ultra doesn’t have a special gum massage mode. Based on the addition of the massage mode, the Aquarius has an LED indicator on the base. It alerts the user to the mode being enjoyed at the moment. Not a feature on the Ultra. The Aquarius has a timer to ensure that you’re using the flosser for the recommended amount of time. Most dentists suggest flossing for at least one minute per day. With the timer, you’re going to definitely get your 1-minute flossing in each day. The device also has a pacer. It’ll pulsate to tell you that it’s time to move to another quadrant of your mouth. Lastly, the size of the units varies. The Aquarius is slimmer and lighter than the Ultra. If you have limited bathroom space, the Aquarius will fit on a counter or shelf better. 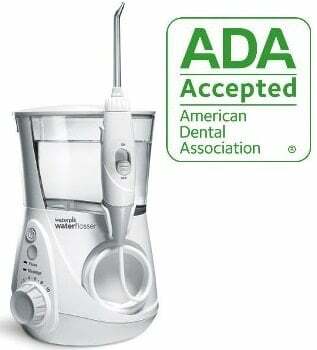 The Waterpik Water Flosser was the first water flosser to earn the seal of acceptance from the ADA. The American Dental Association awarded the company with the Seal of Acceptance based on the fact that it reduced plaque and gingivitis. This makes it a great product no matter which one you choose. 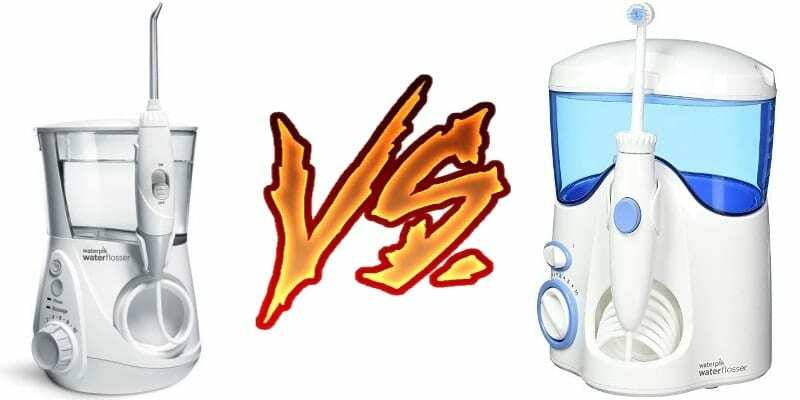 While we trust the company and love their water flossers, we do have a clear winner between the Waterpik Aquarius vs Ultra. The Aquarius has more features like the pacer and timer to keep you flossing longer. There are design elements that make the Aquarius a better choice, too. The footprint is smaller and there are features like the LED indicator and slider button that make more sense. between these two great flossers.